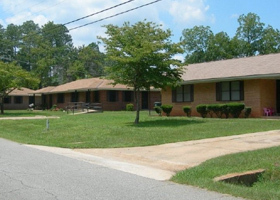 The Housing Authority of the City of Ellaville, Georgia provides affordable housing for single individuals, couples and families. All apartments are income based. These are flat units with various floor plans. The duplex units are spaced along our community giving our families a quiet country living environment; with spacious lawns and yards to spend time with family. There is no application fee and a security deposit is required. There are a total of 40 units with bedroom sizes ranging from one to five. Amenities include central heat and air, range, refrigerator, 24 hour emergency maintenance, washer and dryer connections, propane gas, pest control and a grounds keeping service. Our apartments are located near supermarkets, dining, and banks.